What do I mean by that? Eastern Medicine is focused on utilizing herbs, plants, sunlight, energy, and other natural healing modalities and substances that God created. In other words, Eastern Medicine is actually creation medicine. The truth of the matter is that since the Garden of Eden, plants, herbs, trees, and roots have been used in a therapeutic fashion to heal the body, mind, and spirit. And that’s another facet of Eastern Medicine that needs to be emphasized. Eastern Medicine realizes that the spiritual, structural, psychological, and emotional aspects of a living being are all interconnected and that to treat an individual you must treat all aspects. In other words, you can’t simply treat human beings with chemicals and drugs and expect meaningful results. Speaking of chemicals, any medical doctor will admit that Western Medicine relies on pharmaceutical drugs to “treat” illnesses. In other words, it is chemical medicine. Did you know that the words “pharmacy” and “pharmaceutical” are derived from the Greek word pharmakeia, which can also be translated as “sorcery” or “witchcraft”? No, I’m not saying that doctors who prescribe drugs are witches and warlocks or are “casting spells” on their patients. I’m just bringing to your attention the fact that “pharmaceutical” has a very interesting etymology. 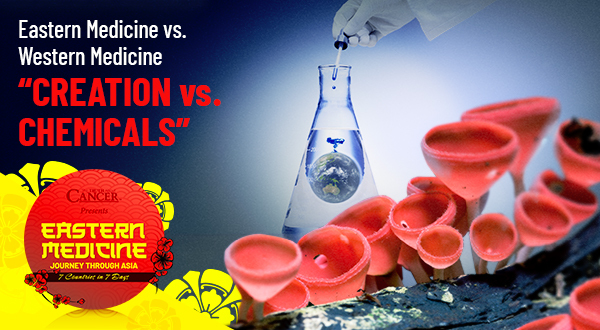 The indisputable reality is that in Western Medicine, pharmaceuticals rule the roost. Another problem with Western Medicine is that it is still based on allopathy, or the “battlefield” treatment of ailments with drugs. Allopathy was very important during both World Wars. Faced with the choice between amputating a limb or patching up the soldier momentarily so he could get back on the battlefield, doctors chose the latter. Drugs like penicillin made this possible. But battlefield tactics belong on the battlefield, not in the treatment of disease! One of the primary reasons why so many people are sick is that doctors are looking at things through the narrow “battlefield” lens and are using “band-aids” (drugs) to temporarily alleviate a symptom, while never correcting the root cause of illness. To reiterate… these drugs, which are literally “controlled poisons” made from chemicals in laboratories, do not heal but only mask illnesses and disease, and only treat symptoms. We call them “medications,” but those who know about true health and healing (with God’s “medicine chest”) are very aware these chemical drugs are based on “pseudo science.” The reality is that there are thousands of potentially deadly drugs that are “FDA approved,” but most folks are unaware that each year in the USA, more people die from legal, properly prescribed prescription drugs than from illegal drugs sold on the streets? That’s right! Each year, over 100,000 Americans die from the known side effects of prescription drugs. This is openly admitted by the FDA on their own website! Did you know that over half of all pharmaceutical drugs now in use were originally derived from nature? Have you ever taken an aspirin? Where does aspirin come from? It comes from a compound found in the bark and leaves of the willow tree. Have you ever heard of Vincristine or Vinblastine? These are chemotherapy drugs that are derived from the periwinkle flower. Another popular chemotherapy drug, Taxol, is derived from the Pacific yew tree. The problem is that aspirin, Vincristine, Vinblastine, Taxol, and all pharmaceutical drugs, have known side effects. The real problem is that when man attempts to “improve” what God has made, the results is almost always a LESS effective remedy with possible negative side effects. What does this indicate? 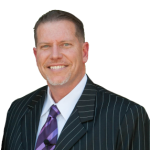 God is the ultimate chemist … NOT man! Did you know that there was once a time when Western and Eastern Medicine coexisted in the USA too? That was until the Carnegie and Rockefeller Foundations started to engineer the medical school curriculum over a century ago. Back in the late 1800’s and early 1900’s, medical schools taught a lot of different things. Homeopathy, naturopathy, chiropractic, and herbalism all had their own schools and were flourishing. But then the Rockefeller and Carnegie Foundations, who were heavily invested in chemical companies (many of which became pharmaceutical companies), decided to do what they did to the steel and oil industries… eliminate all competition. How would they eliminate the competition to their chemical companies (some of which later became pharmaceutical companies)? They commissioned a report, authored by Abraham Flexner, which “found” it was too easy to start a medical school and that most schools weren’t teaching “sound” medicine. But their true motivation was not to protect the public. It was to create a medical monopoly and protect their patents and petrochemicals based medical education. So, despite what you may have heard or thought, this is the real reason Eastern Medicine was never a big deal in the USA. Not because it’s a substandard type of medicine… which it isn’t! If it were widely taught and utilized in the USA, Eastern Medicine would put a HUGE dent in the revenues of ‘Big Pharma’ companies who peddle chemicals. Did you know that the pharmaceutical industry spends roughly $5 billion annually on marketing? That’s more than $8,000 per physician. You see, there’s almost nothing (and nobody) that limitless funds cannot buy. Pharmaceutical companies start early by targeting students in medical school, giving out free meals, textbooks, drug samples, and even vacations! By the time they’re ready to practice, doctors are essentially “pharmaceutical sales reps” themselves. Clearly, the Western ‘medical model’ isn’t working. Healthcare costs are skyrocketing, people are taking more drugs than ever, and Americans are sicker than ever before. If you have previously mocked Eastern Medicine (such as acupuncture and holistic treatments), you might want to give it another chance. One of the main distinctions and what makes Eastern Medicine so different than Western Medicine is that instead of prescribing a “one size fits all” (pharmaceutical drug) for all patients with certain symptoms, Eastern Medicine looks at the needs of each individual and unique body and acts accordingly. I was recently diagnosed with stage iv cancer in the colon, lungs, liver and spine. I do not feel led to do chemo even though the doctors are pressuring me to do so. Please let me know of alternatives. Thank you. Keisha I’m sorry about your illness. I’d suggest reading the book by Dr. Jason Fung regarding fasting and how that naturally heals your body. I think you’ll find it beneficial. I’ll pray for you. what else? enzymes (papain, bromelain, chymotrypsin, trypsin), seleinium (to increase glutathione), magnesium, man koso (fermented, amino acids), etc. green tea, 2 time s week meat (chicken, fish). plus take care of your gut as your immune system is necessary to eliiminate cells out of control by apoptosis. I went to an Ayurvedic doctor who said “Let’s get to the root cause of this”. She did ‘live blood analysis’ where I could see the parasites, the mold, the candida, and inflamed cells. She gave me some Ayurvedic tinctures and a list of what to eliminate from my diet and what to include. I had been to and MD who wanted to give me antibiotics and a dermatologist who wanted to give me cortisone cream. I am 73 years old and she is the only doctor I have been to that wanted to look at what was causing the problem. That’s amazing to hear, Gertie! YES, YES, YES!!! I am so done with Western Medicine! Most docs I’ve had to deal with, are SO CLUELESS about nutrition issues! Makes you wonder what they are actually learning in Med school! Now, at 75, I have spent much of the past 2 decades learning about the health issues I have had to deal with….. and finding CURES, and not just treating symptoms with meds. And because of the steps I have taken….. my body has rewarded me with great health & support – even to the extent that my white hair returned to it original dirty blond color, over a decade ago (and remains so today)! That’s proof enough for me!!! Well done Richard, yes I am also doing the same. 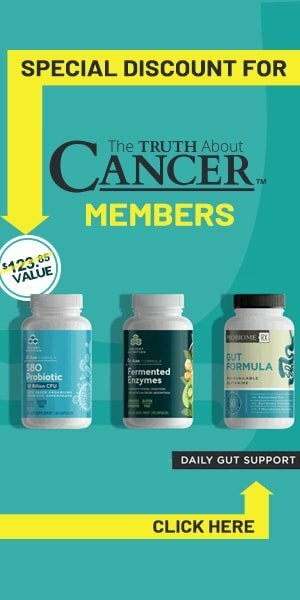 In the last 20 years, (the Internet Years) I have sorted through ALL the Mis-Information, put out by Big Pharma’s, and got true information, that Dr’s never told me about, how I lost both my parents to Cancer and many friends, I no longer fear getting Cancer myself, I feel like I am in control of my life and health, and not controlled and manipulated by Big Pharma. I once studied Eastern medicine, it is wonderful. Western medicine IS manmade chemicals. The Bible Scripture warns us about the ” Pharmakeia” Look to the Bible for the answers. God designed us, he knows what is best for us. I once worked in a hospital as a nurse’s aide. One day a nurse told me that 100,000 people die a year in the hospital. You could tell it bothered her, and hinted it was because of Western medicine. It hurts when you see people die, even more so, when you know they could live with a good medicine.. I would like to sign up for your series on eastern medicine. 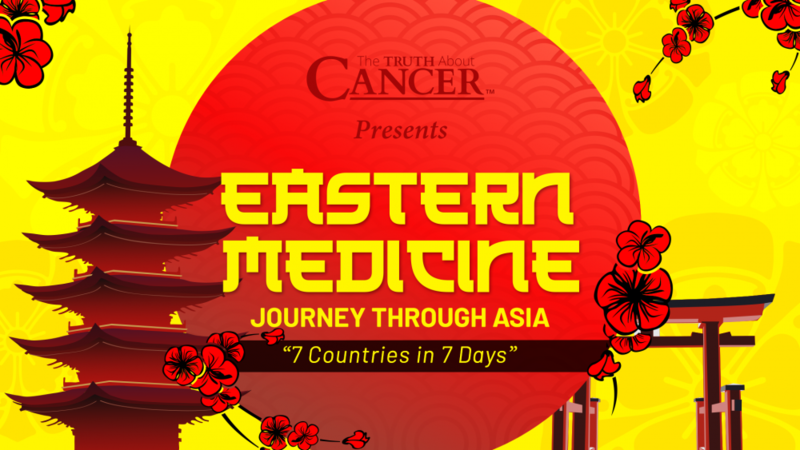 As long as you’re signed up for our emails you’ll be notified as soon as the sign up link is available for Eastern Medicine: Journey Through Asia. You can then enter your name and email address. Thank you for the encouraging information provided in your articles. Also thanks for not using your platform primarily to push products. Your knowledge is greatly appreciated. May God continue to richly bless you, your family and your efforts to educate by making information available. Over 70 years old, I’m elated with the article about Eastern Medicine and wish that all of my friends and relatives would incorporate it in their health-care. ten years ago, my sister, then 81, was told she needed to take 2 blood pressure meds. or she would be dead in 6 months. She lived alone, and died last week at age 91, still on no prescription drugs and just taking her supplements and herbs!!!!! Your sister sounds amazing and it sounds like she was a fighter. It must have been a blessing to know her. We’ll be sure to keep your family in our prayers. Wishing you endless love, blessings, and comfort. Is the Eastern Medicine series available download-able like the first one I bought ? Doctors in Lativa believe I am a candidate for Lativa Rigvir treatment. Scrambling for better treatment and cure. Have you heard anything bad about Rigvir ? My wife and I hope a local (US) cure can be obtained and started. Sad that so many of my relatives like yours have believed the pharma quacks hook, line, and sinker and are no longer with us. The Eastern Medicine documentary will be available in both digital and physical format like our past projects. These are great questions, but it would be best if you reached out to a healthcare professional with your questions. Hope this is helpful. Thanks for reaching out to us! I just want to comment on something that happened this week in my senior apartment building. A man living here with his wife has had an infection in his foot that was not improving. He went to the doctor on Tuesday, was given an antibiotic and was told he might have side effects of nausea and diarrhea. Well, that night he was deathly ill…with constant vomiting and diarrhea, horrid chills, turning white, and he couldn’t move. His wife called 911 and he was taken to the hospital…his temperature was 93 when he was admitted. The hospital emergency crew pulled him through, and he’s home now. If that infection would have been treated naturally, with herbs and other healing plants and/or oils, his emergency would never have occurred. My question….how long will it be before health insurance companies recognize that maladies can be cured with non-pharma methods….and be willing to cover the costs of doing so? I know no one can answer that, and big pharma is a huge business. I’ve read the wonders that coconut oil can do for an ailing body, and have used it for minor injuries, and also drink it in water along with apple cider vinegar. I’m almost 80 and take no medications but I do take health supplements. Actually no. Before the fall there was no need to heal the body, mind, and spirit, and after the fall, Adam and Eve got kicked out of the Garden of Eden. If you’re gonna use the Bible, know it.